Easter Bingo Bingo Cards to Download, Print and Customize! Print 2 pages of Easter Bingo Bingo Cards for free. Download a PDF with 2 free pages of bingo cards plus instructions and a randomized call sheet. 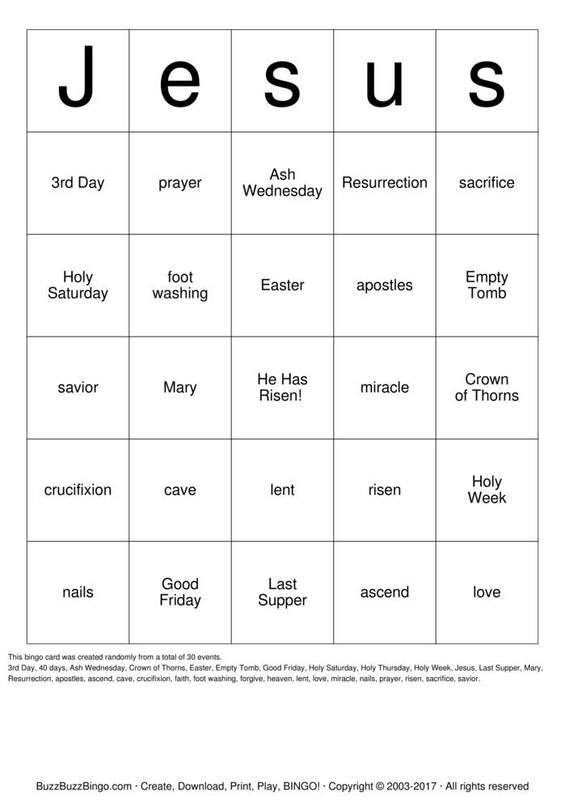 Play Easter Bingo bingo in a browser or customize the events, free space, etc. Purchase more randomly generated bingo card pages below. 3rd Day, 40 days, Ash Wednesday, Crown of Thorns, Easter, Empty Tomb, Good Friday, Holy Saturday, Holy Thursday, Holy Week, Jesus, Last Supper, Mary, Resurrection, apostles, ascend, cave, crucifixion, faith, foot washing, forgive, heaven, lent, love, miracle, nails, prayer, risen, sacrifice, savior.